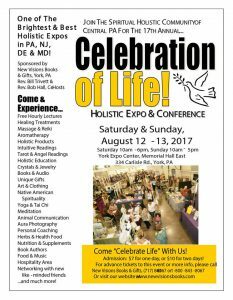 YORK – The 17th Annual Celebration of Life Expo kicked off yesterday and will continue today -Sunday, 13 August – at the York Expo Center. The Expo, sponsored by New Visions Bookstore, offers everything from books and magazines to handcrafted items to angel readings to reiki sessions to natural soaps and oils, to Himalayan salt lamps and everything in between. There will also be free hourly talks of various subjects. Therapeutic Thymes raffled off a one-year subscription yesterday and will hold another today. The winner of Saturday’s drawing is Lisa Gentzler, of York. Congratulations, Lisa. Today’s show runs 10 a.m. to 5 p.m. Admission is $7. The Expo Center is located at 334 Carlisle Road, which is Route 74. The show is in the Memorial Hall Building. © Therapeutic Thymes, LLC, 2017.